BLOG | Job Opportunity: Work for The Campanil’s Ad & PR department, receive extra cash! Are you self-motivated, like building relationships with local business owners and want to earn some EXTRA CASH? 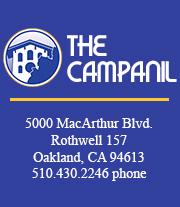 The Campanil’s Ad & PR Department is looking for talented students with strong communication skills. No prior marketing experience needed. You’ll be able to receive payment for every commission you make. Email campanilads@thecampanil.com or the Ad & PR Manager Tymeesa Rutledge at tymeesac@gmail.com for more concrete details.